Despite of the nation-wide call by Sangh Parivar allies to refrain from making donations to the Kerala flood disaster relief fund, a temple trust in the state decides to donate its entire treasury collections to the rehabilitation project. 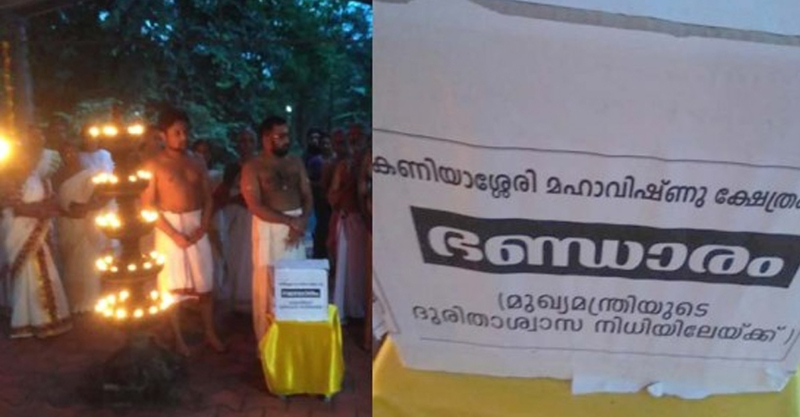 Keezhillam Kaniyasseri Vishnu temple of Eranakulam makes a socially apposite move by signifying that it doesn’t identify itself with the sectarian sanghparivar politics. Earlier, Sangh Parivar wings had unleashed hate campaigns and social media attack on Kerala, alleging that the State doesn’t deserve any helping hand. These campaigns had been taken to the national forefront, while people of Kerala fought the disaster in unison. Temple trust’s decision to make donations is considered as a befitting response, taking this into consideration. The head priest Anil Divakaran Namboothiri officially handed over the entire fund to the relief move. he campaign initiated by extreme right-wing groups had aimed at isolating the state by urging the public to hold back from aiding the affected, claiming that they deserve it. “Don’t donate any money as it will not be used for relief work. It will be used against our country by these leftists by giving it to naxals and JNU Tukde-Tukde gang. Find some other way to help Keralites, not by donating to @CMOKerala” said a tweet circulated by the Sangh Parivar allies. Another tweet went a step further and made an outlandish statement that the natural calamities affected only the Christian and Muslim dominated districts of Kerala. It went on to say that these affected groups are those which engage in foul play with Lord Ayyappa and ‘stupid Keralites’ deserve such hardships.